2017 In A Sentence: In Coach Lane Kiffin’s first season at FAU, he lead a team that had three victories in each of the three prior seasons to one that tied a school record for victories in going 11-3 and went undefeated in C-USA play to win the league championship and win the Boca Raton Bowl over Akron. Biggest Shoes to Fill: QB Jason Driskel was the Boca Raton Bowl MVP and had one more season of eligibility left but decided to retire from football. Driskel completed 185 of 278 passes for 2,247 yards with 15 touchdowns and just four interceptions. The Owls lost just once the 11 games he started, ending the year on a 10-game winning streak. The new quarterback will either be De’Andre Johnson or Oklahoma transfer Chris Robison.. Johnson was sidelined most of last season because of blood clots while Robison sat out per NCAA transfer rules. Key Player: RB Devin Singletary led the nation in rushing touchdowns (32) and points scored (198). He rushed for a total of 1,920 yards and added 198 more as a pass catcher with one more score. For his efforts, the now-junior was named as the C-USA Offensive MVP. 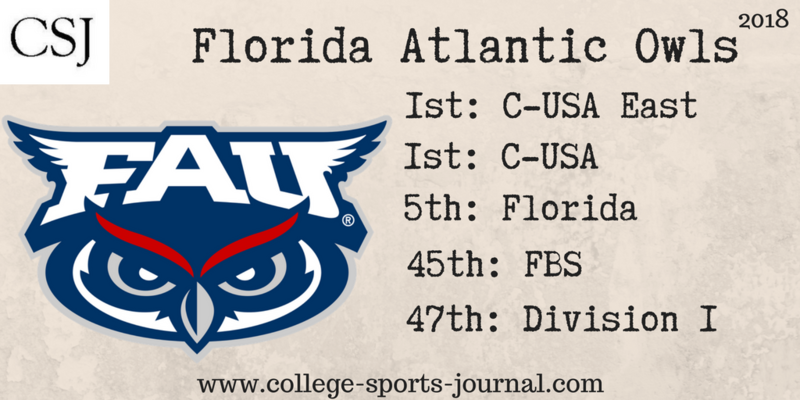 Fearless Prediction: The Owls are the overwhelming favorites in the C-USA this year. And with games at Oklahoma and UCF, the Owls have a chance to be a national contender to get the Group of Five’s major bowl bid.